The Counseling Center Village went through a major redesign over the summer of 2017. Material and links from the previous version of the CCV were carefully reviewed. Those links that were no longer active, or else were woefully out of date and served no historical purpose, were removed (if they could not be updated). Other material was removed if it did not strictly fit the mission of this site to contain material created by counseling center professionals (although I have violated this at times, one of the perks of being the webmaster). Of special note is the removal of the Counseling Center Directory. This was a listing of university and college counseling center websites. The sheer number of counseling center websites, and the continual changes in the URLs for these sites, made maintenance of the Directory impossible. As the years have gone by, it has become easier to find these websites by simply doing a google search. Also removed was the section on counseling center forms and paperwork (the section called At The Office). This collection was out of date with all the new developments in rules and regulations. At some time in the future I may create a new At The Office with an up-to-date collection. 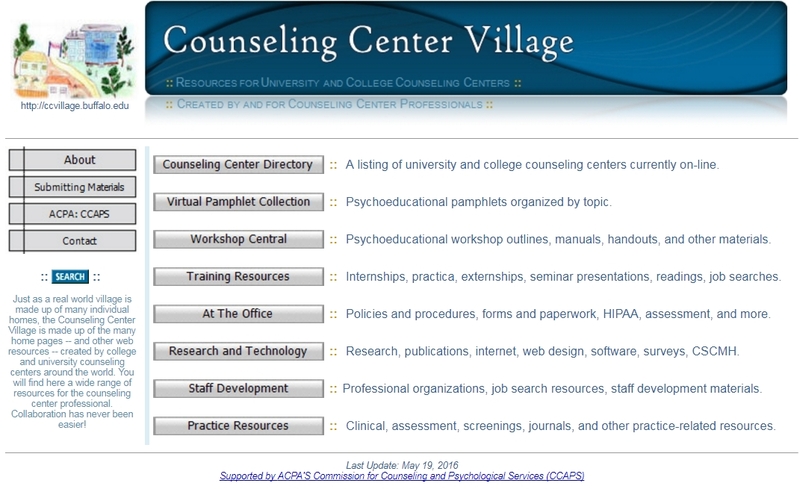 The mission of the Counseling Center Village is to bring together in a single organized web site the expertise and resources of counseling center professionals so that we can all benefit from each other’s’ efforts. 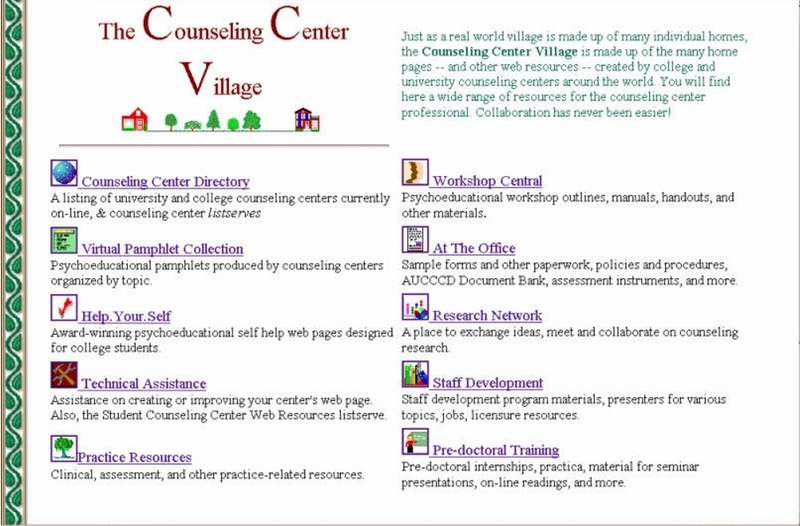 The majority of the content of the Village web pages is created by counseling centers professionals. Although links to non-counseling center sites are included, the emphasis is on gathering together resources, information, and services created by counseling center professionals.